May is National Meditation month! Be Well at CPL and join us for mindfulness based events throughout the month of May. 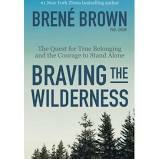 Our Mindfulness Book Group will discuss "Braving the Wilderness: The Quest for True Belonging and the Courage to Stand Alone" by Brene Brown. Please pick up a copy of this title at the Main Library Q&A Desk.